Even when just poured into the glass, you feel straight away that Mr. Frederiksen is a master of potency and great personality. 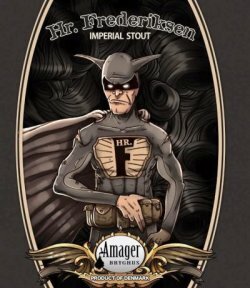 Pitch-black as Mr. Frederiksen’s humor, this American style Imperial Stout has a dense and creamy, light brown head that leaves an abundance of lacing on the glass as it reluctantly settles. Our ginger methyglin. It is a sessionable, dry and slightly carbonated mead reminiscent of a very dry ginger ale. Bright, crisp and spicy, this mead can clear a palette and leave it feeling refreshed and thirsty for more. Exceptionably good over ice, this mead is perfect for a hot day in Missouri. Our super berry melomel. It is a session-strength, petillant and sweet mead made from a blend of wildflower honey with strawberries, blueberries, blackberrries and red raspberries. This beverage is sweet, but not too sweet, fruity and an explosion of fresh berry flavor. Leaky Roof Mikado & Gandy as well! Pours a lovely peach color. Almar Orchard apples and pears form delicious and interesting combinations with cinnamon, nutmeg, and a pleasant bourbon smokiness in this sweet and relatively complex cider. Perfect for get-togethers. Cheers! Lambickx™ is Vanberg & Famille’s brand of hand-selected and blended lambics. Every Lambic with the Lambickx™ name is made from casks personally tasted and chosen by Don Feinberg, one of the ﬁrst importers of Belgian beer to America and founder of the ﬁrst Belgian-only brewery in the U.S. Don chooses his Lambics for their complexity, brilliance and drinking excellence both by themselves and as exquisite accompaniments to food. WORDY! Stone Brewing Supervisor Drew Neldon and Brewer Steve Via joined forces to develop the award-winning beer. When brainstorming recipe ideas, Neldon wanted to brew an altbier, while Via was interested in exploring brown ales. (Before crafting this beer, Via felt he’d never had a brown ale that synced with his palate.) Rather than focus on a single beer category, the duo decided to combine the best qualities of both styles by using four different malts to make a unique mongrel, hence the name: Imperial Mutt Brown Ale. “With such talented and inventive brewers on our team, each installment of the Stone Spotlight Series has had very stiff competition,” explains Stone Brewmaster Mitch Steele. “During the judging session earlier this year, we were most impressed by the English notes coming from Drew and Steve’s beer. After brewing their recipe on our 120-barrel systems, the character of the English ale yeast really shines, along with the interesting blend of malts used.” The beer’s grain bill is made up of Victory, chocolate wheat, Vienna and Honey malts. Fruity and bread-like aromatics are joined by subtle coffee notes. Mild roast and coffee traits carry over to the flavor, followed by hints of toffee and molasses. Magnum and East Kent Golding hops offer a restrained, balancing bitterness to a strong malt backbone. When all these qualities combine, the result is a full-bodied, malt-driven beer that’s smooth and easy to drink. Stone Spotlight: Imperial Mutt Brown Ale is ready to be enjoyed fresh or may be aged for months or several years at proper cellaring conditions (55°F or lower). Although Drew and Steve’s Imperial Mutt Brown Ale will be available in limited quantities, fans can look forward to a new winning beer every year from the Stone Spotlight Series that showcases Team Stone’s brewing talent.